Surprising optimism has been showing up recently among traders and analysts in stock index futures despite continuing worries about our faltering recovery, the European sovereign debt crises and other potential drags on global equity performance. That is quite a turnaround for being just a few weeks after the S&P 500 peaked above 1,400 in early April, up 6.5% from a year earlier and then lost all of its gains for the year to a low of 1,278 in early June. The Dow Jones Industrial Average has swung even more sharply, peaking near 13,280 in early May, up 3.7% from a year earlier, before plunging 8.7% in the next month to a year-to-date low near 12,100. 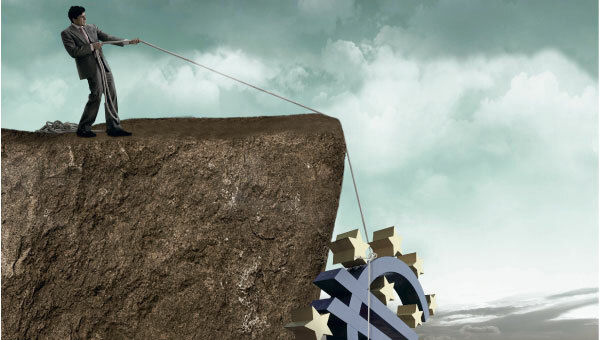 While an ultimate solution for Europe still may or may not materialize, market participants say that factors they see supporting performance among indexes in the next few months include continuing good performance of defensive stocks, historically strong performance among stocks during months leading up to U.S. elections and prospects for kicking the can down the road on the threatened U.S. “fiscal cliff” at year end. The fiscal cliff refers to a point at the end of 2012 when the Bush era tax cuts expire and certain automated spending cuts kick in after the bipartisan Senate panel failed to agree on specific spending cuts last year. While the combination of tax increases and budget cuts would reduce the deficit, it likely also would have a negative impact on growth. The Congressional Budget Office (CBO) estimates that the policies set to go into effect would cut gross domestic product (GDP) by four percentage points in 2013. “I’m bullish on the market,” says Kevin J. Benoit, president and founder of fundamental equity index program Stratford Capital Management. “I know there are issues that are out there that are [difficult and] have potential to be a real problem. However, there are certain things that are more likely to happen than not. Also bullish is Tony Dwyer, U.S. portfolio strategist with Canaccord Genuity, who has a bold target of 1,575 for the S&P 500. Dwyer says the European debt crisis and subsequent fall in global equity markets has priced in a U.S. recession that he believes is not likely to happen. 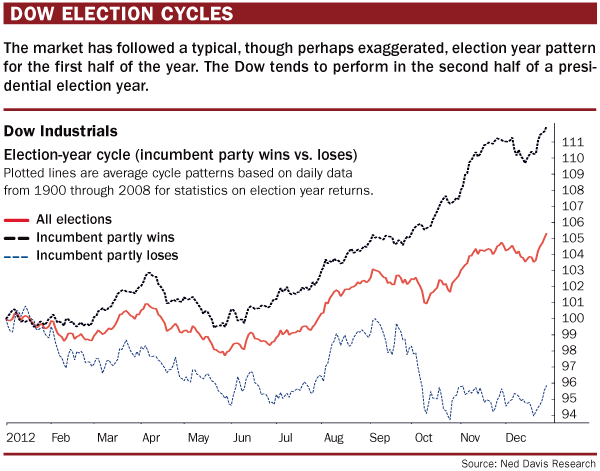 June typically brings the bottom for the Dow Industrials in election years, Dwyer says. The market generally bottoms in the last week of May or the first week of June and trades higher into September (see “Dow election cycles,” below).